I’m thrilled to introduce, Elizabeth, the WAHM (working-at-home mom) behind Cheeky Bunz, a line of cloth diapers and other fun, necessary items for babies and mamas. 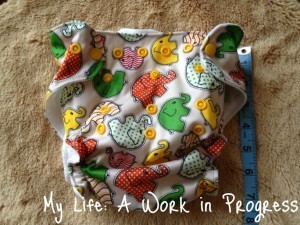 I started making cloth diapers after the birth of my second child! It started out as diapers for my cheeky baby girl, but they were such a big hit amongst my cloth diapering mama friends that I decided to try selling them here! 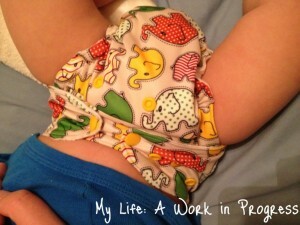 Now almost 2 years later I am making diapers and so much more! I am the lucky mom of two amazing kiddos. Noah is my 7 year old. He is my budding diaper maker (we started with pillows), but soon enough he’ll be sewing like a pro. Charly is my baby, she is 22 months old and the happiest baby I’ve ever met (I may be biased). She is the model and my inspiration for this business! And of course none of this would be possible without the support of my amazing husband! He has always stood by me and encouraged me to follow my dreams! I was super excited to review a Cheeky Bunz AI2 cloth diaper with a Zorb II soaker! I’ve always been curious about Zorb, and this was my first time seeing the fabric in action! 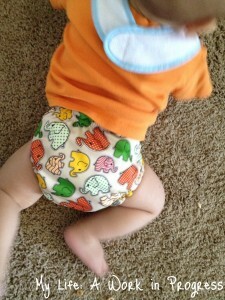 AI2 diapers are becoming a quite popular cloth diaper choice. An AI2 consists of two parts: the waterproof outer part that can be used more than once in between washing and an inner absorbent parter (soaker) that is replaced when wet or soiled. 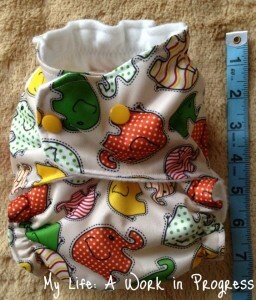 The outside of this diaper is made with waterproof PUL fabric. 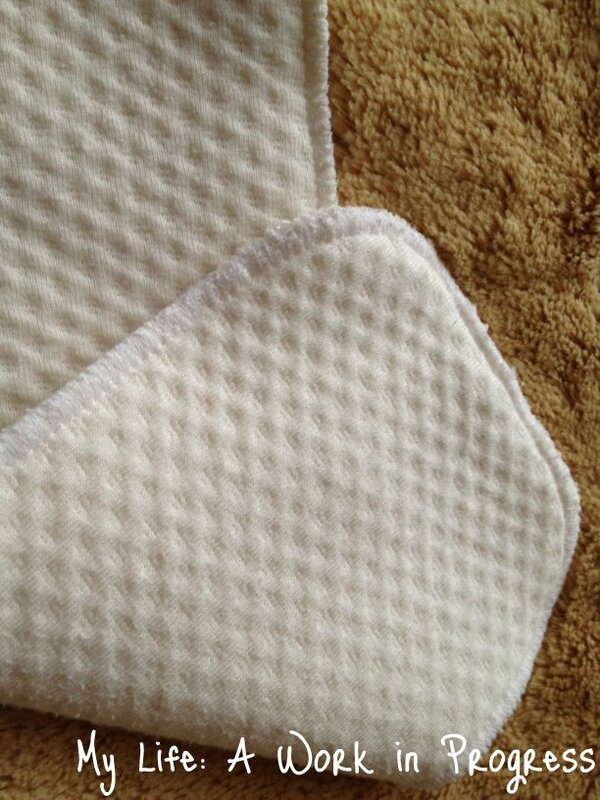 The inside of the diaper part is lined with bamboo fleece, which is nice and soft against baby skin. This diaper is one-size. That means, by adjusting the snaps across the front and waist of the diaper, this diaper will fit many babies from birth to potty training. The waist features cross-over snaps for the little, tiny wee ones. The narrowest point of this diaper is 6″ across. That’s comparable to the majority of cloth diapers I’ve reviewed. 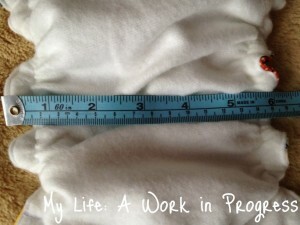 BumGenius pocket diapers are 6.5″ across in the crotch. The Zorb II soaker is 15″ long and made of two layers of Zorb II. There are no snaps on this particular soaker; however, when you purchase an AI2 from Cheeky Bunz Diapers, each AI2 generally includes a snap-in soaker and a lay-in doubler (not snapped). So my experience is slightly different than what you’ll get with your own Cheeky Bunz diaper. In spite of the lack of snaps, I had no issues with the soaker moving around. I found that I was able to customize it just fine. Since it was a bit too long for my son, I just folded over the front. A reversible fabric with a bamboo/cotton face, Zorb II absorbs moisture 20 times faster than fabrics traditionally used for cloth diapers like bamboo, cotton, or hemp. Zorb II also holds the liquid in better and in greater capacity than other fabrics. Each layer of Zorb II is equal to about two layers of microfiber terry, so if you use the Zorb II doubler and soaker, that’s equal to about eight layers of microfiber terry. All in all…Zorb II is a wonderful fabric for absorbing urine. 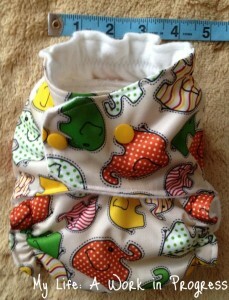 I love the adorable elephant PUL. It’s so cute on Baby J! We got a nice fit around the legs and waist. He could probably wear this diaper on the smallest rise setting, actually; so there’s definitely plenty of room to grow. I generally change Baby J after he’s worn this diaper for two hours. I put the soaker in the wet bag for washing, and meanwhile let the outer part of the diaper air out for a few hours. When I put it back on him for the second go round, I use a generic doubler or a folded prefold inside as a soaker. If Baby J wears the diaper for three hours, the soaker starts to get pretty wet in the front. I left the diaper on him for about four hours once, and pee actually leaked through and soaked the seat of his pants and onesie. I’m assuming that if I had the soaker and the doubler both, this probably wouldn’t have happened. 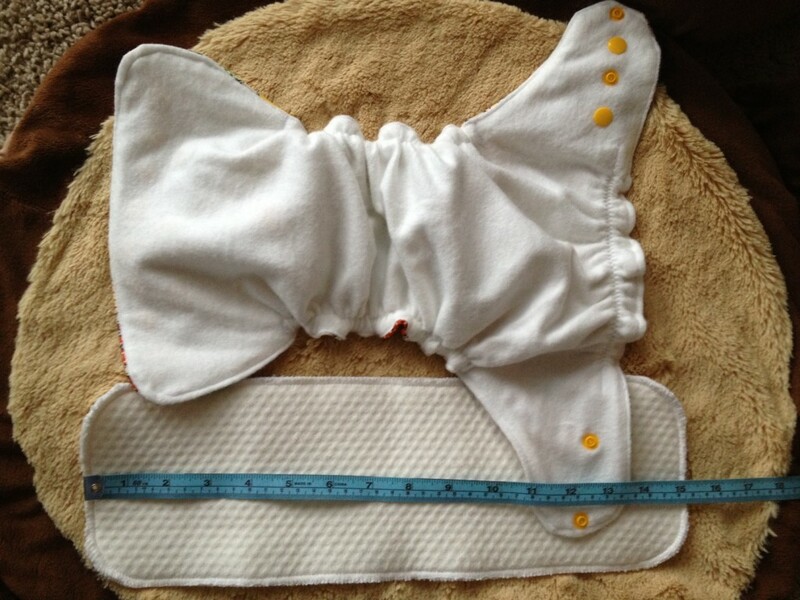 Want your own AI2 by Cheeky Bunz Diapers? Visit Cheeky Bunz on Facebook and Etsy to learn more! Elizabeth is graciously sponsoring a prize for the Bellies to Babies giveaway hop event that starts this Saturday, January 5! Get a head start on your giveaway entries, by following Cheeky Bunz on Facebook! Note: I received a complimentary AI2 cloth diaper and soaker by Cheeky Bunz to review and was not compensated for this post. I was not asked to write a positive review, and the opinions expressed above are my own and may differ from those of others. That is one of the *cutest* diaper prints ever! Also, I think this Zorb insert is intriguing – I’ll bet that would be better for sensitive-skinned babies! 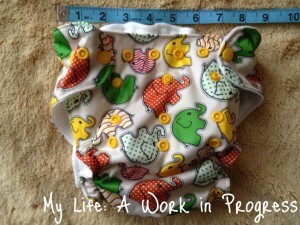 I love AI2 diapers and this print is adorable. Thanks for sharing.